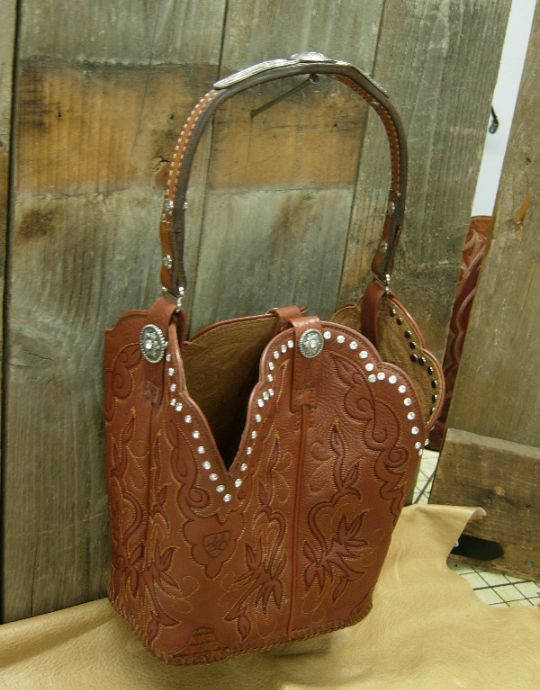 The Diamond 57 Cowboy Boot Bag is the original design by Sue Roake of Gresham, Oregon. I created this unique bag when my husband had an accident and could no longer wear his boots. I thought what a shame to just have these hand crafted boots sitting in the closet when we’ve had such wonderful adventures traveling and showing our miniature horses! I was inspired to preserve those memories in a useful, creative and stylish way. Each boot has a tale to tell in where it’s been and what it has endured! Some came from the easy life of the dance floor, others are hard worked cowhide straight from the ranch. Each purse is made from authentic, all leather, vintage cowboy boots. The handle is also made from working stock, all leather, embellished with silver, crystals and western buckles, some with horse bridle head stall or bits. Every bag is guaranteed workmanship, however, all are enhanced with it’s own story to tell, from the scar from the barbed wire fence or possibly a scuff from the hard wood floors they once graced. Each purse is an original, branded, signed and numbered by me! Our family brand the “diamond 57” was created from the inspiration of my husband. Because of him all this is possible. He was born in 1957, We have 5 children and there are 7 in our family, so I recognized 57 was meant to be. The diamond shape was designed to represent taking something rough, worn out and tired, and giving it the opportunity to become something beautiful, useful and once again treasured, just like a diamond in the rough. There’s nothin’ like a new pair of boots to make her smile!